Woody Allen returns to his beloved Cannes with his story of crime and punishment in a sleepy up-state town, Irrational Man (2015), which was screened this morning to press outside of the main competition. Joaquin Phoenix plays Abe, a maudlin philosophy professor who, following his umpteenth scandal, finds himself teaching at a backwoods college. Here he meets Jill Pollard (Emma Stone), a beautiful student who is soon enamoured with her sensitive, vulnerable professor, much to the chagrin of her nice-guy boyfriend Roy (Jamie Blackley). However, although happy to pour out his soul to Jill, Abe is unwilling to start a relationship, preferring the more age-appropriate charms of Rita (Parker Posey). Abe considers himself a moral man, and there’s something likeable about him, but he’s also a man in crisis. Having had some bad experiences – which Jill helpfully fills us in on – Abe finds himself suicidal with ennui, with an obvious drink problem and (worse still) impotent. All changes when Abe and Jill overhear a conversation and Abe is inspired to concoct a crime that he feels would render the world a more just place. We’ve got plenty used to Allen flitting from outright comedy to darker material, then to something in-between. From Crimes and Misdemeanors to Blue Jasmine, Allen has managed to create some very effective dramas. 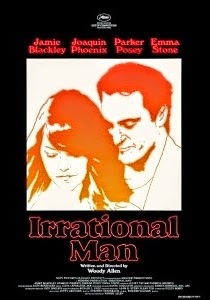 Irrational Man has a lot in common with Match Point and Cassandra’s Dream, taking Dostoevsky as inspiration. Both leads produce solid performances despite a sloppiness in both the direction and the writing. Abe is a drinker so is constantly hoisting a hip flask. That’s not character; it’s a prop. Likewise, his being a philosopher professor seems to involve him quoting the best-known quotes of major philosophers as his lessons and coming out with easy “radical” fare (“all philosophy is verbal masturbation”). In fact, most of his character is not revealed to us so much as spoken to us by other people. Phoenix does his best, but there he goes with that hipflask again. Stone is better as the fresh-faced Jill who sees in Abe the possibility of connection with a deeper more authentic reality. But she too is occasionally flummoxed by some cloth-eared dialogue. “We must go horse riding again, I enjoyed that,” she tells a friend. Cut to shot of friends horse riding. The moral conundrums that arise from Abe suddenly wishing to intervene in the world and find once more meaning in his life have already been explored and explored better in previous films. There is always the disconcerting shift as familiar Allen dialogue and that vigorous jazz score begin to filigree an essentially a tale of moral corruption, but this familiarity also extends now to the familiar plot, concerns and questions. Of course, wishing that Allen would revert to his “earlier, funnier films” is a stance that has been critically proscribed by the director himself in Stardust Memories. Perhaps someone should tell him that it’s perfectly fine to read Dostoevsky without having to imitate it.